they may be worn down from care giving. need as part of their treatment plan, regardless of where they live or when they need it. stories of managing chronic pain. accessing medication, scarcity of specialists and more. caregivers, in order to achieve the best possible quality of life. Stroke, Arthritis, Pains, Aches, and Overweight / Obesity with their care givers. therapy & Research Centre and other agencies. Our support group allows survivors to help themselves and other survivors create meaningful lives. chronic pain and don’t have any result to produce. respective individual pathway to health and well being. rehabilitation) for all those suffering from Stroke, Arthritis, Pains, Aches, and Overweight / Obesity. Zone 1. Wednesday 5th September 2018 10am prompt. 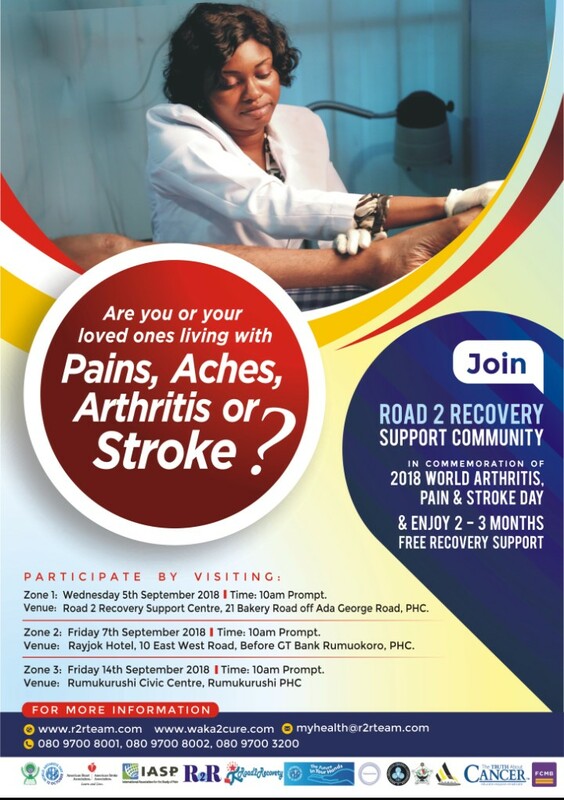 Venue: Road 2 Recovery Support Centre, 21 Bakery Road off Ada George Road, PHC. Zone 2: Friday 7th September 2018 10am prompt. Venue: Rayjok Hotel, 10 East West Road, Rumuokoro Road before Guaranty Trust Bank PHC. Zone 3: Friday 14th September 2018 10am prompt.